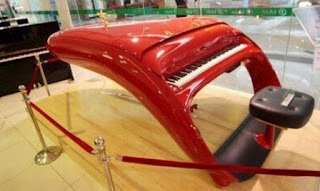 Some years ago I was working in Parson's massive piano warehouse in Kowloon and stumbled across two remarkable pianos. There was a bright red one designed to look like a - and I believe actually designed by - Ferrari. There was also a transparent one, made of a kind of see-through plastic which meant you could see all the inner workings with remarkable clarity. The piant manufacturer Dulux includes a few shades in its vast cataologue which it calles "Grand Piano" (which they might equally well have called "Ostrich Intestine" for all the relevance it has to the particular shade of paint), and its greyish/brownish hue seems to have been inspired by the rear end of that Old English Sheepdog which remains the company's iconic mascot. 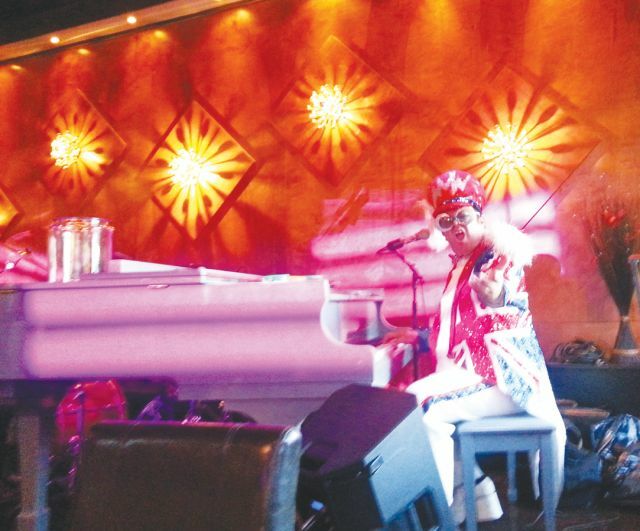 Of course, white pianos have always been in vogue in certain musical environments, and do I recall seeing Elton John playing on a pink one? There's a discussion forum I stumbled across which suggests all sorts of answers (wrong, weird and very rarely wise) as to why grand pianos are usually black, and I remember a phone call I had from the people who were restoring my own grand piano in which they very tentatively suggested that I might like to secure the services of a French polisher in order to remove the black lacquer and restore the original walnut wood of the case. 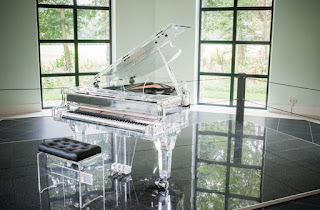 They seemed to think I would be appalled at the idea: I was not, the piano went off to the French polisher and came back looking spectacular (and, when I wasn't playing it, sounding pretty spectacular too). What a shame that piano was destroyed on that ill-fated sea-journey my belongings attempted (but failed) to make from Singapore to Gravesend back in 2012. An earlier grand piano in my possession came to me courtesy of the INLA (for the uninitiated, that's the Irish National Liberation Army, who exerted much effort in trying to oust the British from Northern Ireland by blowing up just about everything they could find). When a bomb destroyed one of the most lovely Georgian homes on the Donegal/Derry border (in which an eminent legal personage lived), taking with it both the man of the house and his wife's right hand, it also ripped the legs off a massive Grotrian-Steinweg piano. The maimed and grieving widow offered the piano to me as bomb-damaged goods, and I found someone to stick the legs back on and get it into a vaguely playable condition. That piano was black, although the blackness was more the result of the fire which followed the bomb, and it made a most unfortunate noise when it was played. I was told it had once been a fine mahogany - turning it into a black instrument had done it no favours. There is certainly no good reason why pianos should be black, or even dark brown for that matter. The only reason it seems that red, blue, pink, transparent or any other colour are not all the rage is that people tend not to take them seriously as musical instruments. In a world where appearances are everything, one expects pianos to be dark and sober and, quite simply, a rainbow piano demeans itself before it has even uttered a single middle C.
I am as guilty as anyone in having that colour prejudice against pianos. I can live with black or brown, but I never believed the red could possibly be serious, and the transparent one was, surely, just a joke. So imagine my amazement when out of the blue (excuse the colour pun) a green piano appeared in our music conservatory. Not just any green, either. A pretty vile, bile-like green. As one colleague said, staring at it in utter disblief, "is that to be played by a leprechaun?" The picture of Lanskey and green piano in action has been stolen unashamedly from Chang Tou Liang's Pianomania website. Let him sue if he dares! It had its first public airing a few days ago and was not played by a leprechaun. In fact the pianist could hardly have been less leprechaun-like, and his giant frame largely eclipsed the green little Johann Strauss model Bosendorfer. A green shimmer did pervade the hall, however, but came not from the piano but rather from the envious eyes of every pianist in the audience who marvelled at the wonderfully sensitive, refined and infinitely subtle playing of Bernard Lanskey. What made it all the more disturbing for those of us who have attempted in our own way to master Mozart's sublime Quintet for piano and winds, was that this incredibly fine playing was coming, not from a great pianist at a great piano, but from a great pianist at a green piano! If the cost of getting a piano to integrate so beautifully into the textures of this extraordinary work is to paint it green, so be it. The scales have been lifted from my prejudiced eyes, even if the green hue remains. As for the piano, it was a gift from Mr Tan Kah Tee whose support and generosity towards the Conservatory in Singapore seems utterly boundless. If one might have suspected he had ulterior motives in passing a green piano on to the Conservatory, one can only hang one's head in shame. He knows his pianos and has come up with something which not only sounds fabulous but achieves what few other instruments have ever done; broken barriers of prejudice. That said, I still have my doubts about that transparent one - and as for the pink one. Well... you've got to be joking! My lawyer will be having a word with yours, over cups of green tea!